Todolwen: It's Been A Long Time .. It's Been A Long Time ..
it has been very warm outside these past days so instead of working in our backyard, I am staying indoors and being a little creative which I am enjoying so much. Here is just a little sneak peek of something I am working on right now. I am hoping that I will be able to share my newest creations in the next few days. 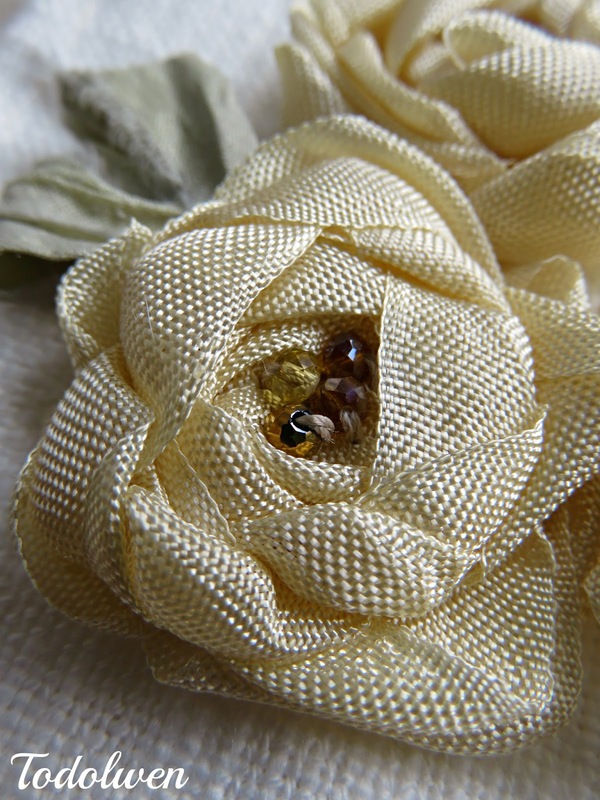 It's been such a long time since I have made seam binding roses, so I thought it would be really nice to do something with them again. I had forgotten how rewarding these beautiful blossoms are. 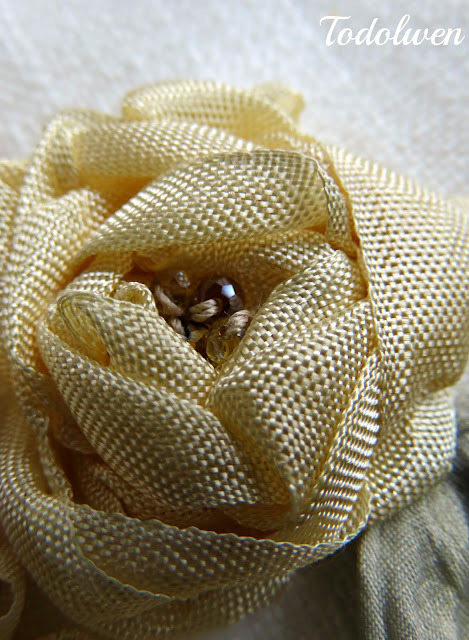 A simple piece of seam binding becomes a beautiful flower and that which in a short time. The only thing that could make these even better than they already are were if they would smell and I am sure that could be done very easily too if someone wanted to do so.. If any of you haven't made seam binding roses before and would like too, pop over to my tutorial page. There you will find my tutorial on how to create these lovely blossoms. Talking about my tutorial page ... you will find many tutorials on all sorts of neat things that you can learn how to make. You will find the how~to`s on things, like my hymn page feather or my little crochet 'flutter~bys' and so much more. There is a little something for everyone, so why not take a look. It was so nice of you to stop by here at Todolwen today and it would be lovely if you came back some time again. Oh Karen, I love your roses! I am so glad, that I found your blog long time ago by your paper feathers tutorial. I love the directions and you pictures are so clear to follow. I must try this rose. 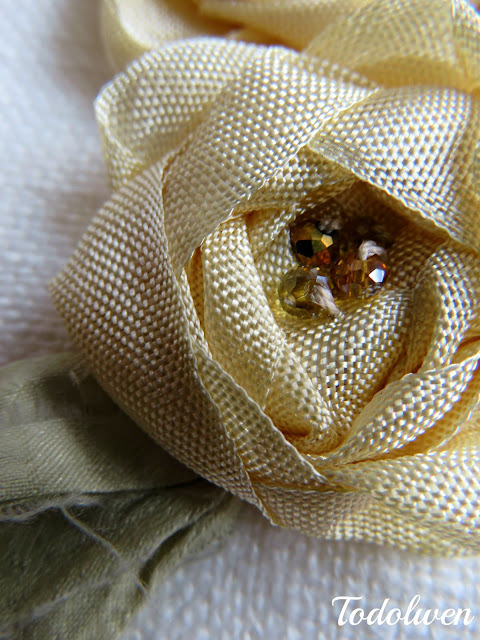 I make seam binding flowers all the time. They are fun to make and adorn cards perfectly. Thanks for sharing with others. Thank you for reminding us about these pretty flowers! I have them on my list to make at some point. Sweet Smelling Pretties From My Garden ..
Not Every Lid Needs A Pot .. Finally ... Now Listed In My Etsy Shop ..
An Old Butter Dish ~ Part 2 ..
An Old Butter Dish ..
A Project For This Year ..
Update On Fort McMurray .. Please Pray For Fort McMurray's People ..